Circle Ceremonies - an opportunity to come together to quiet our minds, reconnect, and be lovingly nurtured... using wisdom from the ancient ceremony of women circle. An opportunity to come together to quiet our minds, reconnect, and be lovingly nurtured... using wisdom from the ancient ceremony of women circle. A Circle Ceremony brings together your most treasured family and friends (your tribe of people regardless of gender) to acknowledge the amazing contribution they make upon your life, and to prepare yourself for one of the most special days - your wedding day. The Circles are a wonderful way to quite our minds, reconnect and be grounded. Sometimes we can experience heightened levels of emotion and physical exhaustion, and Circle Ceremony can help return us to a more balance, grounded and happier place. 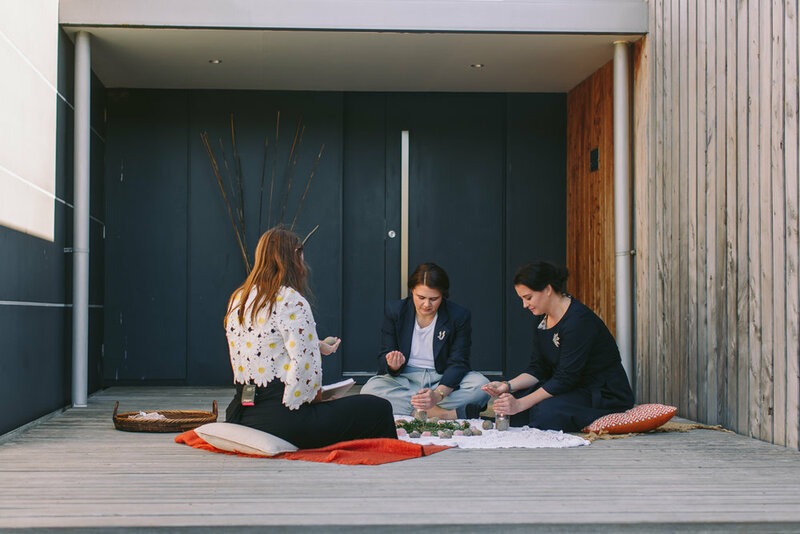 Circle Ceremony is designed specifically for pre-wedding relaxation + is treated as a 'gift-of-love' for you and your bridal party, regardless of gender. Merren arrives at your location, creates the centrepiece, and sets out all the little goodies for each ritual, making sure everyone feels welcomed and comfortable. She lovingly facilitates the Circles so you feel deeply cared for and nurtured. an unforgettable experience that is fun, meaningful, grounding and deeply caring. "Merren organized a beautiful Sisterhood Circle before my wedding – candles, stillness, singing bowls and crystals! It was something so special that I know my mum, bridesmaids and I will never forget. Merren is the creator of memories." My fee is $200 for approx. 30 minute pre-wedding circle ceremony. Ideally this is best suited for small groups of 3 to 8 people. Travel fee of approx. $0.80 / km for ceremonies located outside the greater Hobart area (please check with Merren as this may not apply if she is booked as your Marriage Celebrant).